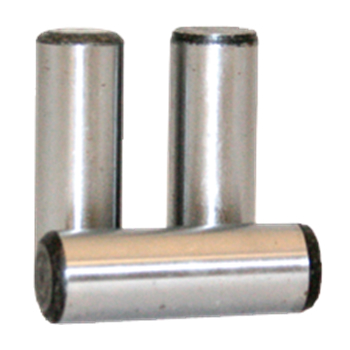 Dowel Pins are solid, headless, straight pins with a closely controlled diameter. One end is chamfered with the other end radiused to form a crown. Dowel pins have a variety of uses, including as a plug gauge, hinge or shaft. Precise tolerances of dowel pins make them excellent for achieving proper alignment of parts in high-speed assemblies, or as roller bearings in bus/truck wheel housings. Important Note: Dowel Pins should be installed by being pressed in, not struck with an impact force.